Universal Credit has undergone some changes and as of January 2015 Jobseekers with children (familes) can now make new claims. Only specific groups of jobseekers are able to claim Universal Credit. See the attached Information Leaflet for further details. All Housing Benefit claimants will be migrating over to Universal Credit. DWP have launched a new guide 'Universal Credit and You' which gives an introduction to UC for people who are claiming it. It covers lots of useful information for both claimants and support staff. Details can be found here. You were recently sent a letter stating your rent will increase on 1st April. You must act to make sure you get the right amount from Universal Credit from 1st April onwards. Failure to do so may result in you receiving not enough money to pay your rent. You cannot update your journal before the 1st April because the change has not happened yet. Make sure that you know your new rent charge. Your rent and service charge must be entered separately. If you have no service charge then you must enter £0.00p or the system will not let you proceed. Follow through the questions and then submit, this should then show on your Journal as notifying a change. 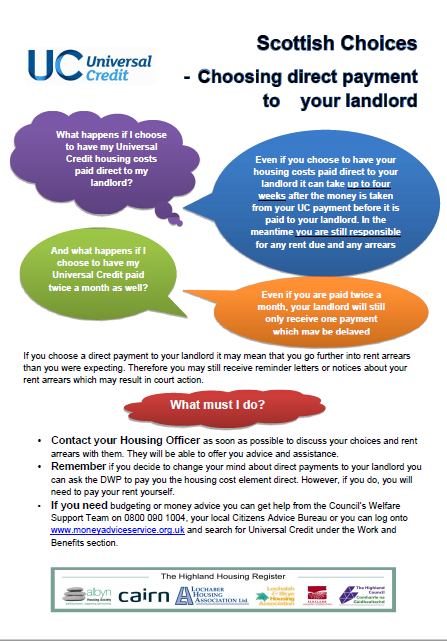 Write a note in your journal to let Universal Credit know you have provided your new rent charge details. If you pay your rent by Bank Standing Order or Direct Debit, make sure the new rental amount is being paid to your landlord from April onwards. Check your next payment from Universal Credit to ensure you are getting the new housing element amount. 0300 323 0990 - North Office or 0300 323 0991 - South Office. You may never have heard the term ‘untidy tenancy’ before, but for those it affects, it’s an important one to get to grips with when Universal Credit is concerned. So, what is an ‘untidy tenancy’? An ‘untidy tenancy’ is one in where someone on the lease has left the property and is not paying rent, for example, if a relationship has broken down. Other examples of untidy tenancies include situations where a partner has died, moved away or been imprisoned for more than 6 months, leaving the remaining member solely liable for paying the rent in order to remain there. This can also apply to non-couples living together who are “jointly & severally liable” for the rent. For example this would apply when two siblings or a group of friends living together and claim Universal Credit separately, but one person permanently leaves the house, requiring the remaining residents to take on responsibility for the full rent. Universal Credit would normally treat everyone registered at a home as being due to pay an equal percentage of the rent. Now, however, the DWP’s “Decision Makers” (the people processing Universal Credit claims) are able to split the housing costs part of a Universal Credit payment to make sure that the person who has become responsible for paying the rent will receive the correct amount of money in their payment. If both partners are named on the tenancy agreement, then they will be “jointly & severally” liable for the rent. This means that, in the event that they separate or one person dies or goes to prison, the other should be automatically able to claim the full rent. However if the tenancy is in the name of just one member of the couple or household, and that person dies, or for whatever reason, leaves the home, the remaining resident(s) can qualify for the “housing costs element” even though they are not legally liable. The aim of this is to make sure that people who are effected by a break-up, bereavement or other change in living arrangements are able to meet the contractual rent and remain in the property. What should you do if you’re affected? If you find yourself in an ‘untidy tenancy’, or you aren’t sure whether you qualify or not, you should inform the DWP and your local Albyn housing officer as soon as possible. Informing the DWP is key as the sooner you update your circumstances the sooner a change in payments can be made. Albyn housing officers are fully trained in all aspects of Universal Credit and are happy to answer any questions you may have about untidy tenancies. They can help you and point you in the right direction whatever your situation may be. As Universal Credit continues to hit the headlines it is becoming increasingly difficult to separate the fact from fiction on this issue, and to understand the important updates that could impact on claimants. At Albyn Housing Society, we are committed to helping our customers equip themselves with the important information they need to make informed decisions. So, here is a handy guide to the most important Universal Credit updates from the last couple of months. The allocation process for the Universal Credit benefit system has been controversial since the beginning. Recently, the controversy surrounding the system came to a head as a challenge from the High Court played out. The High Court case was brought about by a group of people who are currently in receipt of Universal Credit and primarily challenged the unfair and confusing payment date system. Previously, if two payment dates fall within the same calendar month the recipient of UC was paid twice, but this was viewing ‘by the system’ as though they had been given a double payment and were therefore paid a ‘vastly reduced’ Universal Credit payment. This was challenged and deemed to be ‘unfair’ by the group raising the High Court case, citing the reason for their frustration as being ‘they could not control what dates they were paid on’. The High Court ruled that the Department of Work and Pensions was not justified in deducting other benefits to make up for the ‘double payment’ and that people receiving Universal Credit should not lose out because of the Department’s handling of payments. This will no longer affect UC recipient’s payment allocation. As the system currently stands, families cannot claim additional Universal Credit payments for a third child born after April 6, 2017. There had been plans for this to be extended to all families with more than two children even if the children had all been born before that date. This has not been progressed and children born before April 6, 2017 are still eligible to be included in a Universal Credit claim. The Department of Work and Pensions was due to start transitioning people on ‘legacy benefits’ i.e Housing Benefit over to Universal Credit starting in June. This transition period was due to affect approximately three million people. In light of recent changes in the system, the extent of this managed migration has been scaled back. The first trial phase of managed migration will include just 10,000 people and will focus on ironing out any potential failings in the process before it is rolled out to the remaining people. The trial will begin in June this year and last for six months. The Secretary of State for Work and Pensions has outlined changes due to take place in the current system. If you have any questions about how Universal Credit will affect you, contact your Housing Officer in the first instance. Our staff are up-to-date with all Universal Credit news and more than happy to answer any queries or help in any way they can. Did you know the Scottish Government has rolled out a new benefit to support expectant mothers? The ‘Pregnancy and Baby Payment’ was launched on the 10th of December last year by the new Scottish Government agency, Social Security Scotland. The new benefit means you could be eligible for up to £600 in additional support to help with the costs of having a new-born child such as clothes, prams and any other expenses. You might have heard about it on the radio, or seen it mentioned on social media, but not known whether it is for you or how to apply. That is why we’ve compiled this handy guide to tell you everything you need to know about the Pregnancy and Baby Payment. If you are receiving one of the above benefits and are the baby's birth mother, you can apply for support from 24 weeks pregnant up until the baby is 6 months old. If you're not the birth mother, you can apply if you're living with the birth mother and the two of you are a couple, married or civil partners. The benefit is a one off cash payment made to the mother or baby’s family. There is no stipulation on how the money is spent. If you are making a claim for the birth of your first child then you will get a payment of £600. If the claim you are making is related to a child that is not your first, then you will receive a payment of £300. For twins, triplets or similar you will receive £300 per child as well as an additional £300 payment to cover the increased cost of multiple births. Claims can be made online through the Social Security Scotland portal here. If you’d rather apply by phone then don’t worry, you can do that too by calling 0800 182 2222. If you still have questions about how to apply for the Pregnancy and Baby Payment or whether you are eligible, than call Social Security Scotland on 0800 182 2222 or speak to your local Albyn Housing Officer who will be happy to help. ‘Help to Save’ is the UK Government’s newest scheme aimed at helping people receiving Universal Credit and Working Tax Credits to build their savings. We want to help Albyn Housing Society customers get the most out of the scheme, so here’s a handy guide. If you receive payments as a couple, you and your partner can apply for your own ‘Help to Save’ accounts. You would need to apply separately. The bank account allows you to save between £1 and £50 each calendar month, and there is no obligation to pay money in every month. There are a couple of ways to deposit money. You can pay money into your ‘Help to Save’ account by debit card, standing order or bank transfer. You can only withdraw money from your ‘Help to Save’ account to your bank account. You get bonuses at the end of the second and fourth years of saving and the bonus is based on how much you have saved. After two years, those utilising the account get a 50% tax-free bonus on the highest balance. If you continue saving you could receive another 50% tax-free bonus after a further two years. Over four years a maximum saving of £2,400 would result in an overall bonus of £1,200. After four years your ‘Help to Save’ account will be closed and you will not be able to reopen it or open another ‘Help to Save’ account. But, the money is yours! You’ll be able to keep the money from your account. You can close your account at any time but if you close your account early you’ll miss your next bonus and you will not be able to open another one. If your highest balance does not increase, you will not earn a final bonus. If you’re interested in finding out more, visit https://www.gov.uk/get-help-savings-low-income or speak to your local housing officer. From the 15th of May 2019 there is going to be a change to Pension Credit that will impact mixed aged couples wishing to apply. Currently and until the 14th of May 2019 couples where one individual is above and the other individual is below the qualifying age for Pension Credit are able to make an application for Pension Credit. After 14 May couples in these circumstances will not be eligible to apply for pension credit; instead they will have to apply for Universal Credit. Mixed age couples who are in receipt of Pension Credit on 14 May will continue to receive Pension credit after that date so long as there is no break in their entitlement. While many people in the Highlands have already transitioned onto the new Universal Credit system, there are a selection of residents yet to make the migration. As of June 2019, the Department of Work and Pensions will be rolling out a ‘Managed Migration’ of people who are currently on legacy benefits, over to the new Universal Credit system. Here are five tips to get ahead and get prepared for Universal Credit. Whether you’re a whizz on excel or jot everything down in a notebook, it’s worth investing some time in your budget. It doesn’t have to be an intimidating process, all you need to know is what you have coming into your bank account, and what you have going out, and as long as you have more coming in than going out you’ve successfully budgeted. There are a range of great budgeting apps available to download, or pop into your nearest Citizens Advice Bureau and they can talk you through the simplest ways to budget, allowing you to be fully in control of your finances ahead of Universal Credit. The majority of communication for Universal Credit is done online. Applications, journals, help and advice can all be accessed digitally, so make sure you’re confident enough to embark on an online journey alone, or ask your local housing officer to guide you through the process. You can access the internet free of charge from any of the Albyn Housing Society’s office premises, community libraries, job centres and Citizens Advice Bureaus. Getting a good current account is invaluable – use online comparison tools to get the best account to suit your needs. It’s also worth setting up online banking so that you can keep an eye on your daily outgoings and monitor your overall budget in real time. There are always unforeseen expenses but if you’re prepared for these, they shouldn’t make too much of an impact. With the new Universal Credit system, you have the option of paying your rent to your landlord direct, or the Department of Work and Pensions can pay it directly to your landlord on your behalf by debiting the money from your allowance before it is paid to you. The decision is completely up to the tenant, however for the sake of being completely in control of your finances, it is advisable to ensure you receive your full entitlement and make the payment to your landlord yourself. That way, you can then set up a direct debit or bank transfer to your housing society and stay in control. By paying rent like this, you can be absolutely sure that it is paid, and just as important, paid on time. In the initial roll out stages of Universal Credit, it takes a bit of getting used to the payment dates, so, it’s worth having a chat with your bank. Make them aware that you are transitioning over to the Universal Credit system and you’ll be surprised at how accommodating they can be. By doing so, you can alleviate the stresses of overdraft charges, and late payments. If you can, put a small amount of money away every week in preparation for the transition to Universal Credit. There is a lag time between an application and first payment where you may receive no money, so it’s wise to have a small pot of emergency money available to get you through a couple of weeks. If this isn’t an option, which for many it won’t be, you can apply for advanced payments through Universal Credit, although the payback period can be strict. The nights are drawing in and the days are getting colder so we thought we would bring a bit of warmth to your kitchen by sharing some great recipe tips. Here at Albyn we know that cooking on a budget can be a real challenge, especially for a family. That is why we have scoured the internet to find the best dinner recipes that allow you to feed four for a fiver! While exact prices might vary depending on where you shop and the offers that are on, these budget-friendly recipes aim to make sure low cost doesn’t mean low quality at mealtimes. We’ve put together a mix of meat and vegetable based dinners as well as a couple of soups to warm the soul this winter! Got a recipe you think people should know about? Share it with the Albyn community HERE! To kick us off we have a Mexican meal that has become a household favourite from Acapulco to Achmelvich. A perfect quick and easy meal that won’t break the bank! BONUS TIP: If you like it hot then why not mix some chilli powder with the other spices! There is nothing quite like a casserole to get you feeling cosy after a long day. This sausage based recipe is sure to go down a treat with all the family. Who says risotto has to be a fancy meal?! This vibrant, nutritious meal is equally suited to having friends and family round for dinner or as a quick end of the day meal. Enjoyed by vegetarians and meat eaters alike this risotto is a cheap and tasty showstopper! What better way to beat the winter chills than to coorie in with a curry? This warming and healthy dish will leave the whole family satisfied! Stir in the garlic and curry paste and cook for 2 mins. BONUS TIP: If you make too much you could of course freeze it but why not add some water and blend so you have an aromatic soup for the next day?! Winter and soup go together like summer and ice cream! This classic recipe is as delicious as it is cheap and is sure to raise a smile on even the bleakest of days…especially when you remember how little it cost! Saute the carrots and onion for a few minutes until the onion has softened a little. Pour in the vegetable stock and add the coriander. Bring to the boil, and cook until the carrots are tender, about 10 minutes. In just fifteen minutes you and your family could be enjoying a taste of the Italian countryside with this filling, hearty pasta dish. An ideal recipe that won’t short change when you’re short on time! Add oil to a frying pan and fry pancetta/bacon for a few minutes until golden and crisp. Add garlic, fry for 1 minute, then turn off the heat. Lightly whisk egg and yolks with most of the Parmesan and some salt and pepper. Add eggs and 1 tbsp cooking water to the pasta, then mix until pasta is coated and creamy. Stir in the pancetta/bacon and garlic then serve, topped with the remaining Parmesan. BONUS TIP: For an extra health boost why not add some sliced mushrooms when frying the bacon or mix a handful of frozen peas in at the end…or both! This dish wouldn’t look out of place in a fancy restaurant and is a great option for when you’re looking for something a little special to lift the spirits this winter. Either by itself or with a side of new potatoes people won’t believe it was less than a fiver! Imagine if you could have a taste of South-East Asia ready to serve in twenty minutes without needing to order in a takeaway? Well imagine no more because that’s exactly what this dish is! Heat a splash of the oil in a large non-stick frying pan over a high heat. When hot, crack the eggs in and turn the heat down. This should make the eggs nice and crispy – without burning – while the yolks cook. Use a fish slice to remove, set aside on kitchen paper and cover with foil to keep warm. Add the remaining oil to the pan, then scatter in the chopped spring onions, chilli, ginger and garlic and gently fry until softened, about 2-3 mins. Tip in the beaten egg and leave for 30 seconds until just set, then mash up with a spoon. Tip in the spring greens with a splash of water and cook until wilted. Add the rice and soy sauce and mix everything together, then season and tip into two bowls. Top with the eggs, sliced spring onion and sesame seeds to serve. Much like the risotto this is a simple, classic Italian dish that seems like it should be far more expensive than it is! A rich, filling meal that will soon become a family favourite. No winter recipe guide would be complete without a vegetable soup would it? Now we can’t promise it’ll be as good as the one your Granny used to make but we can promise big flavour and low cost! The beauty of this is its versatility, if you can’t get all the vegetables or if you just have some in the fridge needing used chuck them in and enjoy! Heat the olive oil in a large nonstick saucepan. Add the onion and cook until softened. Next add the carrot, garlic and celery and cook for 5 minutes. Add the thyme leaves, pearl barley and vegetable stock and simmer for 25 minutes, or until the barley is tender. Add the broccoli and tomatoes, and cook for a further 5 minutes. Season to taste. To serve, stir through the spinach. Ladle into bowls and spoon some pesto over each one. Drizzle some extra virgin olive oil over each one and serve. Despite all the picturesque postcard scenes of snowy mountains and frozen lochs shimmering in crisp winter sun, the transition from summer can be a challenging time for many. And with Christmas preparations and colder nights just around the corner, the chance to save some money on energy bills is always welcome. So, by cutting down on wasted energy elsewhere, you don’t need to think twice about putting on the radiator. Here are five easy ways you can save energy this winter, helping you to keep the bills down, the temperature up, and perhaps save a penny or two for the festivities! All rooms are not equal: One of the simplest tips on the list, but it’s still incredibly effective. If you know you are going to be spending most of your time in the living room then does the bathroom radiator really need to be set at the same temperature? Does the bedroom radiator need to be on all day if you’re going to be watching TV next door? By setting the radiators to different temperatures based on how you use your home you can drastically cut down on wasted heat! Timing is everything: Almost all thermostats come fitted with a timer that could lead to big savings on your bill. If you know you’re going to be in bed between 10pm and 7am, then there is no point having the heating blasting through the night. Instead set the timer to come on at 6.45am meaning you wake up to a toasty room and the knowledge you’ve saved money while you slept! Bleed the radiator not your bank account: Bleeding a radiator is a lot easier than you’d think, and the only special piece of kit you’ll need is a radiator key that can be bought for less than a pound! By releasing air that has built up in your radiator you can make it hotter and more efficient. Just make sure to do so when your heating is switched off and the radiator is cool, a handy step-by-step guide can be found here! Foil old Jack Frost: It’s easy to forget the heat that comes out the back of our radiators but this shouldn’t be wasted! Foil radiator reflectors help the heat sent toward the wall bounce back into the room rather than being lost. Available to buy in most hardware shops, these can be a real money saver. If you’re looking for an even cheaper option though, regular kitchen foil placed on the wall behind the radiator can have a similar effect! Shut the door on wasted energy: By simply shutting the doors to each room in your house you can keep heat in and bills down! Heat gets lost circulating around the home, especially when heating isn’t needed in some rooms. Making sure the doors are closed to keep heat in is so simple but so effective. BONUS TIP: We know we promised five tips but this one was just too effective and easy to miss out. Your curtains, much like doors, can have a huge impact on the warmth of your home. Natural heat might not be what we usually think of in winter but by opening the curtains when there is sunlight you can make the most of the Sun’s heat. Then, when the sun goes down, closing the curtains helps trap heat in your home through the long nights! While they may have fallen out of fashion in recent years storage heaters can still be an effective way to heat your home. By storing heat overnight then releasing it over the course of the day they take advantage of lower electricity prices at night. To get the most out of your storage heater, we’ve put together these handy tips to help you keep cosy and save money this winter. What is tomorrow looking like? Change your input settings based on tomorrow’s forecast. If it is likely to be relatively warm the following day then your heater will need less charge to keep the house warm. Turning your input setting down will save you spending money on electricity you won’t need the following day. Likewise if it’s looking extra chilly tomorrow then think about turning the input up to make sure you have enough heat to get through the day. Providing you’re warm enough at home it is best to leave your output at a minimum overnight and into the morning. This stops unnecessary heat use through the night and allows you to have as much stored heat as possible for use the following day meaning you can make sure your house is toasty when the next evening is drawing in. Steer clear of using additional plug in heaters to top up the heat. In almost all cases the storage heater will be a more efficient option so if you’re feeling the need for extra warmth then increase the input and output on your storage heater. Finally, if you’re going to be away from the house for a day or two then turn your heaters off at the wall. Doing this saves you using electricity heating a house that doesn’t need it which is good for the environment and your bank balance! Preparing for the summer holidays can be a time filled with fret, stress and financial worry for many parents. This summer, leave the stresses in the shade with Albyn Housing Society’s top tips for preparing for the holidays. Planning ahead will not only alleviate the stress of a six week stint with children at home, but it will ensure you get the best deals and best prices on various different activities meaning the school holiday schedule will be filled up in no time. Planning days at local museums, bird watching spots, local parks and ponds, and swimming pools are free or inexpensive activities that can be stretched out across an entire day. This is a perfect opportunity to take a picnic and avoid unnecessary eating-out charges. Having a busy schedule will mean the days spent at home become a luxury rather than a chore for both parent and the child. Those days at home should also be planned ahead; treasure hunts, picnics in the garden, bug collecting or identifying, garden tea parties, free printable activity sheets and movie nights are sure to keep everyone entertained. For just £10 per month, you can become a member of the National Trust and have unlimited family access to castles, workshops, gardens (over 500 venues) as well as free parking at all National Trust associated locations. For older children, just £10 a year will give them unlimited access to these venues*. Many local community libraries have free workshops or reading classes available throughout the summer holidays and should be utilised by families. Get in touch with your local community centre now and find out what programme of school holiday activities they will be running. *This option doesn’t include free parking. With most rail providers offering free rail travel for up to two children aged between 5 – 15, planning a day in an exciting new town or city has just become much more affordable. Having a day on the train can be stress free if planned in advance. You can prepare key landmark train bingo activity sheets in advance and make the train journey an interactive experience for children. Keeping an eye out for key landmarks and countryside features will keep them entertained for hours! A couple of healthy homemade snacks are also handy to have nearby; sliced up apple, carrot sticks and melon are cheap to buy and stay fresh in an airtight freezer bag. If you start picking up a couple of additional food items in each shop, it can make a massive difference in the long run – especially in the discounted aisle. Freezable items are perfect for stockpiling – loaves of bread can be frozen and re-toasted for breakfasts and picnics, any discounted fresh produce can be frozen on the day you buy it and used for summer dinners. Catering for three meals a day rather than just one or two will have an impact financially but a couple of simple savvy cooking tricks can make your food shop go that extra mile. a) Adding red lentils to bolognaise or chilli con carne adds additional protein to the meal as well as stretching it out by another 50%! The red lentils will puff up and will be almost undetectable in amongst the other ingredients. b) Yellow lentil dahl served with rice is a very simple, and very cost-effective meal option. A packet of yellow lentils costs £0.75 and can make up to 10 portions of dahl… and it freezes like a dream! c) Finely chopping carrots, onions and celery makes a tasty and substantial base for most one-pot dishes. This trick helps to stretch out the meal and is helps you to sneak lots of vegetables into dishes, and they go undetected by children. Win, win! d) Buy now, freeze and use at a later date. Having a freezer filled with frozen meats, bread and frozen vegetables ensures meal prep time is less stressful, less costly and in the long run, healthier.